We had no right to such perfect conditions. We were headed to the rainiest city in Canada. 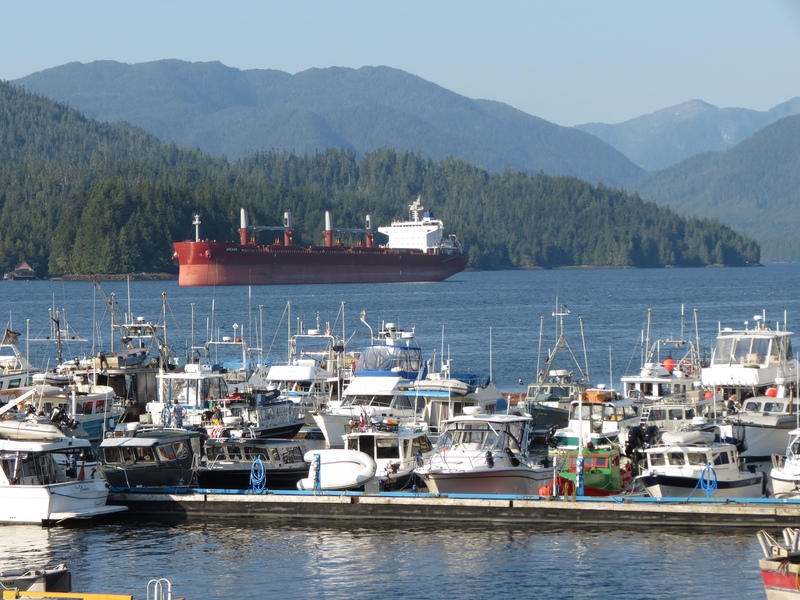 Sandwiched between the mountains and the ocean, Prince Rupert is well situated to be cool and wet. No doubt it has earned its reputation legitimately. But we experienced the opposite. Loading up our bikes in front of the lodge, the sun’s golden rays were just crawling down the trees as it emerged from the mountaintops. We would soon feel its heat under yet another cloudless blue sky. 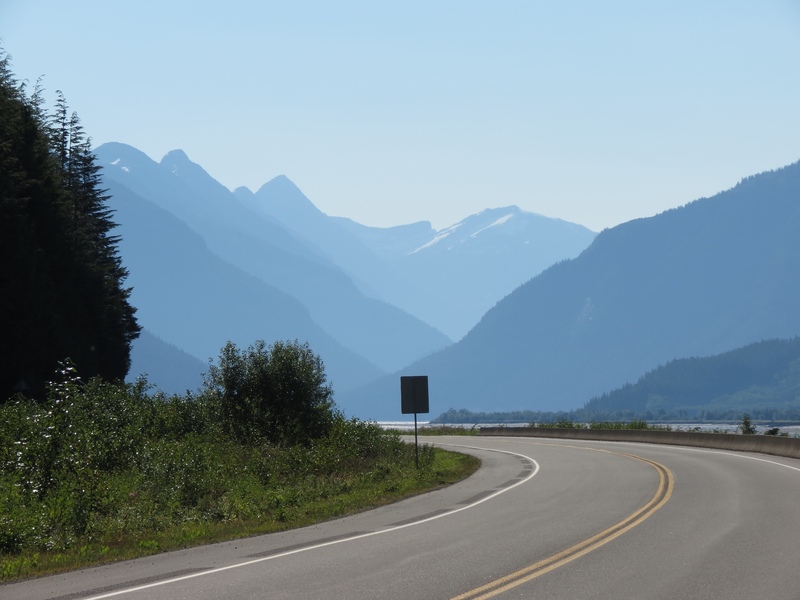 The short driveway returned us to the Yellowhead Highway where the weekend squelched heavy traffic, replacing it with trucks pulling large fishing boats. For 31 idyllic miles our bicycle wheels turned effortlessly. 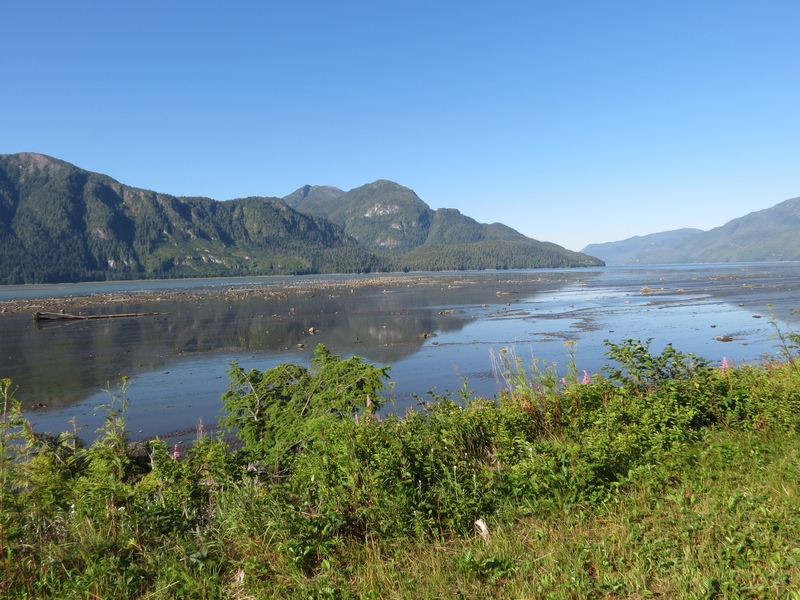 Perched on the edge of the Skeena River, the road was as flat as the water’s surface. 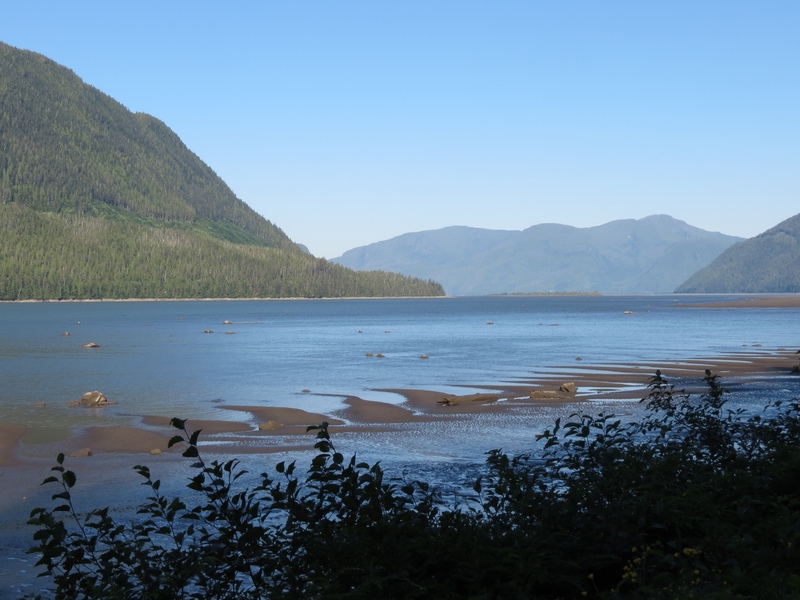 We rounded every headland and circled each inlet with the river. 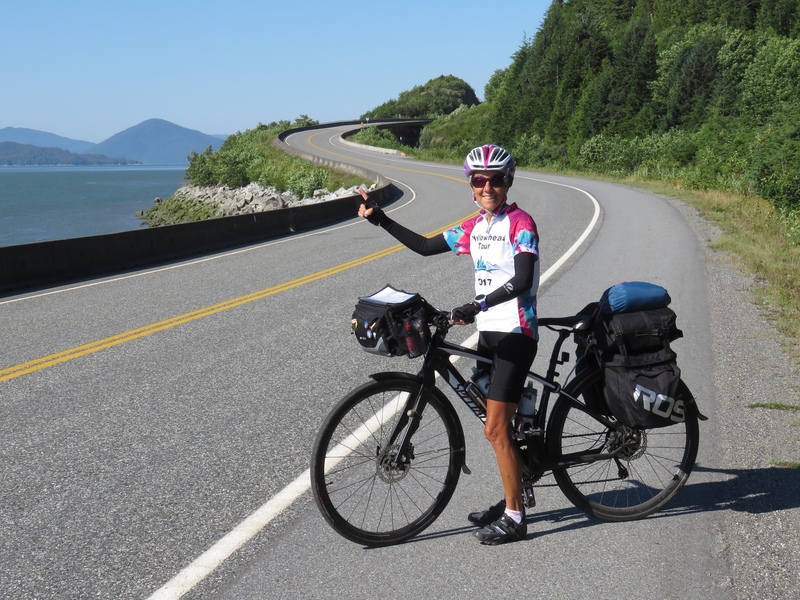 With a hefty wind at our backs and smooth pavement for our tires we sailed as if riding the river’s current. The railroad also enjoyed this shoreline bliss. A long line of colorful freight cars passed, reminding us of our own train journey along these tracks just 10 days ago. Reaching the point in the river where it mixes with the ocean’s salt waters, we could see the impact of low tide. Sandbars emerged and the calm shallow tidepools made reflecting ponds of the river’s surface. Looking back, the sun turned the receding mountains into shadowy images. We left the sharp peaks behind while the remaining pinnacles smoothed into softer mounds. Their shrinking outlines were reassuring knowing we’d soon cycle over not around them. It was clear when this nirvana ended. 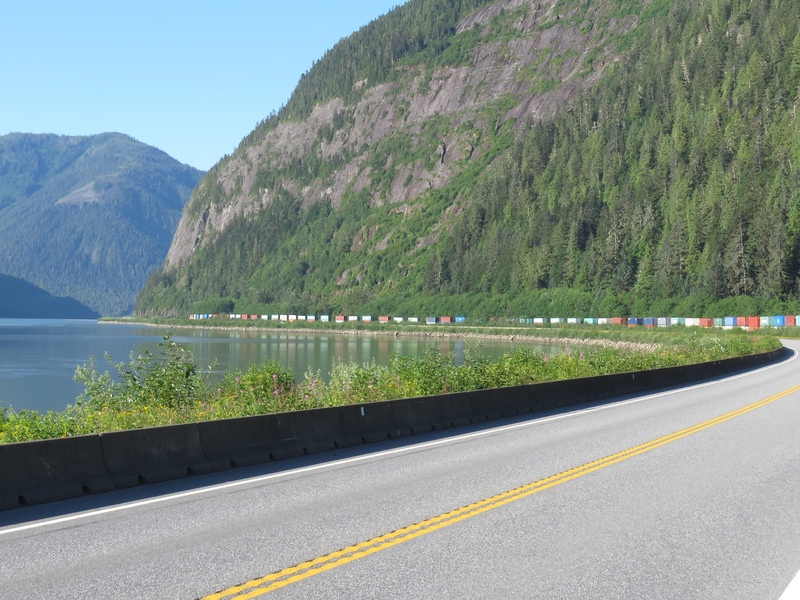 The road turned inland, abandoning both the river and the train tracks to make its final 24 mile approach to Prince Rupert. Fearing the worst, we discovered the best. A number of pristine mountain lakes graced the forest land. The voices of children playing in the water floated up to our viewpoint. I longed to join them. 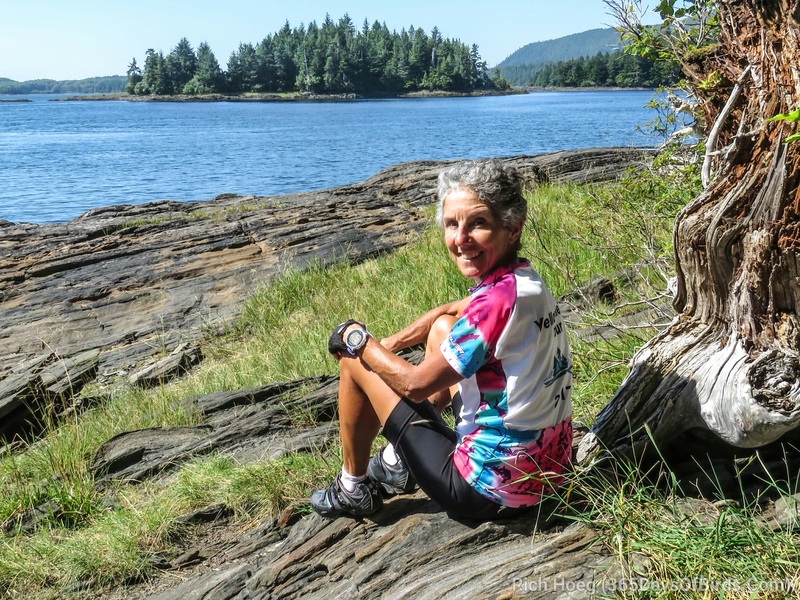 A campground introduced us to another couple cycle touring. Occasional sea breezes cooled our journey but left the sunshine in tact. 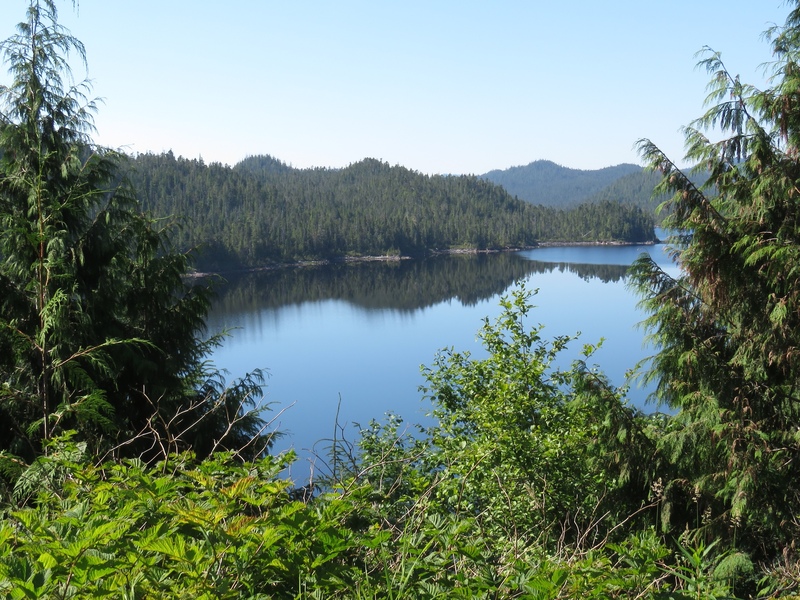 And a wilderness viewpoint greeted us as we crossed the waterway to reach Kaien Island, home to Prince Rupert. 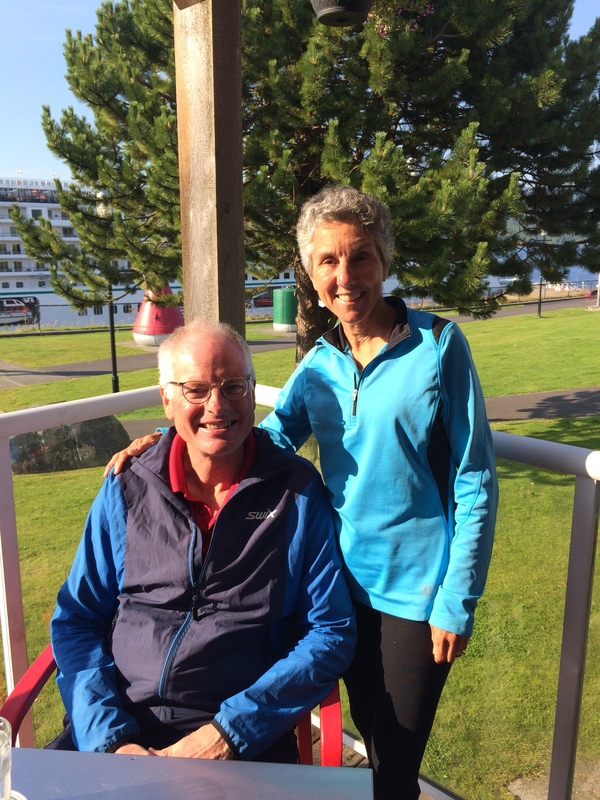 We caught the port city of Prince Rupert at its sunniest best. Arriving at the same time as a huge cruise ship, we sought out some ice cream and watched it dock and disgorge its passengers. 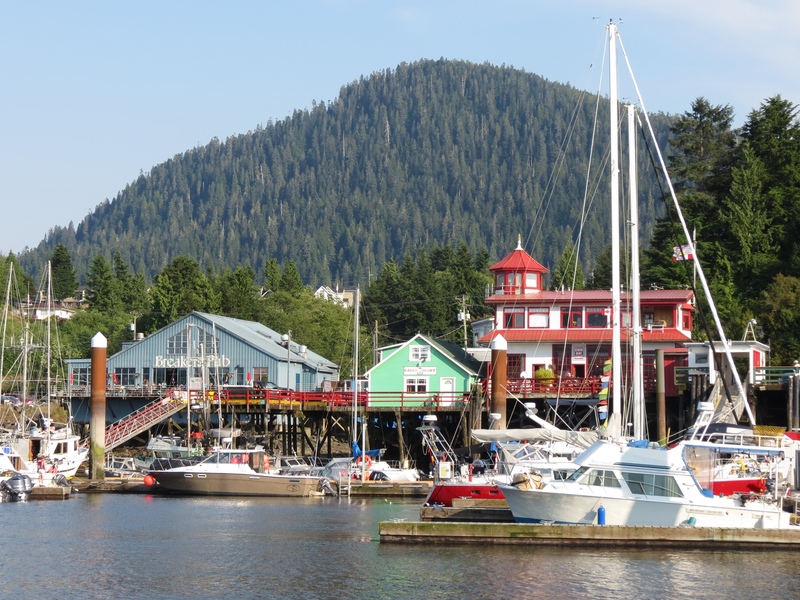 Avoiding the trendy tourist-favored restaurants in Cow Bay, we had a delightful dinner outside on the deck of Cargo Kitchen overlooking the harbor and marina. The sun still reigned over the city, but in the distance we could see fog rolling in. By bedtime it enveloped our motel. We completed our final push to the sea just in time. 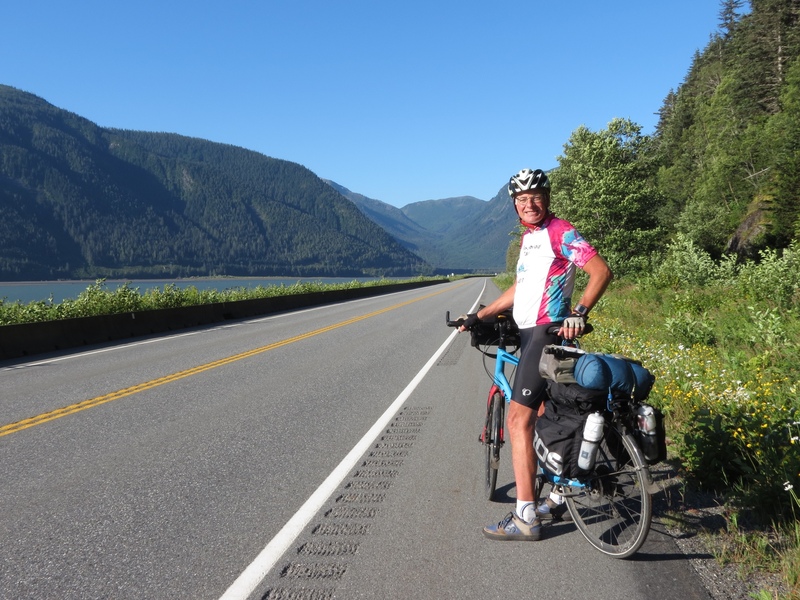 This entry was posted in Keeping Fit, Travel and tagged British Columbia, Cycling, Cycling Trip, Travel, Yellowhead Cycling Tour by Molly. Bookmark the permalink.